28.07.2015. Perhaps a divine intervention or fate led to events that make me wonder. Kathy and I were visiting Dadiani Old Cellar in the Shmegrelo region of the country Georgia. Monks own the property, church, mansion and winery. The grounds are beautifully landscaped. 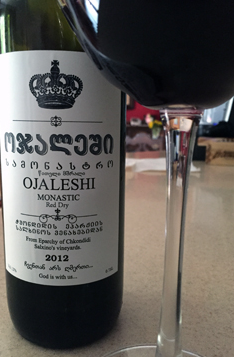 We enjoyed a tour of the entire property and settled in the cellar of the winery to taste what the monks call the Rolls Royce of Georgian wine – Ojaleshi. We throughly enjoyed the setting. A long table had a hole cut out in the center. Affixed to that hole was a qvevri filled with the almost black colored Ojaleshi wine. We could have spent hours there enjoying the camaraderie. On our return to our vehicle, the monk that led our tour tracked us down and gave Kathy and me a bottle of Ojaleshi. It made it home to Maryland just fine, securely packed in my suitcase. For the past year, I pondered when to open the bottle. I was looking for the right time to seize the moment. This was not an ordinary wine, after all it was the Rolls Royce of Georgian black wines. 26.07.2015. (Hvino News). "Tsangala's" is the name of a new wine bar and shop opened yesterday in Tbilisi. The bar/shop is located in the heart of old Tbilisi, close from the famous Rezo Gabriadze Theater with its quirky clock tower and artistic atmosphere. As the owner Otar Tabatadze explained, that the name Tsangala comes from Georgian traditional song "Tsangala da Gogona". The shop was inaugurated with an elegant reception accompanied by live jazz. The shop has a professional wine expert on board and is targeted not only at general public but at wine connoisseurs as well. The bar/shop offers a broad selection of Georgian wines from leading winemakers, including selected qvevri wines. Sommellier Gaga Maisauradze (on photo) explained to Hvino News the advantages of wine bars like Tsangala's: the wines are stored professionally and taken good care of, wines are served by glass and may be tasted prior to purchase, clients receive professional advise on wine-food pairing. Regarding pricing, the wines at wine bars are not necessarily more expensive than at ordinary shops, and may be even cheaper. "So there is no reason at all to shop for wines at supermarkets", - concludes the sommelier. Otar - the shop's owner - is also a wine business professional. As he noted, the next step will be production of his own wine. This will not take too long, as his vine is already planted. 25.07.2015. Representatives of wineries believe that the current year will be very difficult for winegrowers. As stated by CEO of Schuchmann Wines Nutsa Abramishvili, due to lower sales, wine companies have large stocks of unsold wine. "In addition, all companies have their own vineyards, respectively, this year the demand for grapes will be significantly lower than last year when there was a real boom. The price of grapes was very high, and in recent years has reached a maximum due to the opening of the Russian market. On the one hand, it is certainly good, since wine-growing regions have received tens of millions. But on the other hand, the price of the product has risen , the cost has increased that is very bad for the competitiveness of Georgian wine. So we have both positive and negative result, "- she said. A similar opinion is shared by the founder of Telavi Wine Cellar Zurab Ramazashvili. According to him, his company this year is not going to buy grapes from farmers in large numbers. "A situation with export remains unfavorable, although in recent months a dramatic deterioration has not been observed. Export of our company in this year decreased by 30%. In order to balance the situation we are entering new markets, such as South Korea and Mongolia. 23.07.2015. 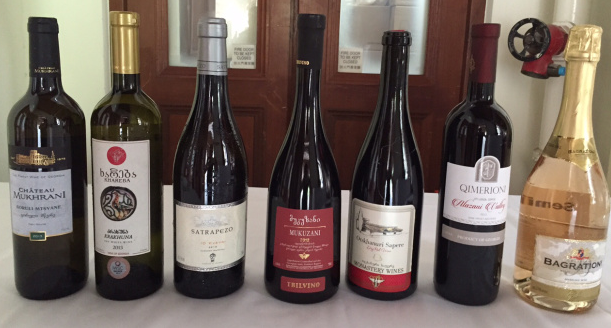 Last week I attended an event showcasing wines from Georgia (read also Hong Kongers embrace Georgian wine trend) hosted by Debra Meiburg M.W and her team from Meiburg Wine Media. In the interests of transparency I should mention that I have worked for Debra previously and that my inner wine geek is rather partial to a glass or two of Georgian white wine. 23.07.2015. Around 150 wine professionals, wine lovers and trade gathered on Friday, 17 July at Hong Kong’s historic Hullett House for a historic tasting – the largest collection of Georgian wines on offer at once – hosted by Master of Wine, Debra Meiburg and Meiburg Wine Media, along with several visiting Georgian winery representatives. Divided into a walk around-style tasting, a trade-focused seminar and an exclusive “dine with the winemakers” dinner, the event saw 40 different Georgian wines on offer to attendees, who ranged from the city’s top importers, to food and beverage professionals, interested collectors and wine commentators (read also: A taste of Georgia in Hullett House, Hong Kong). 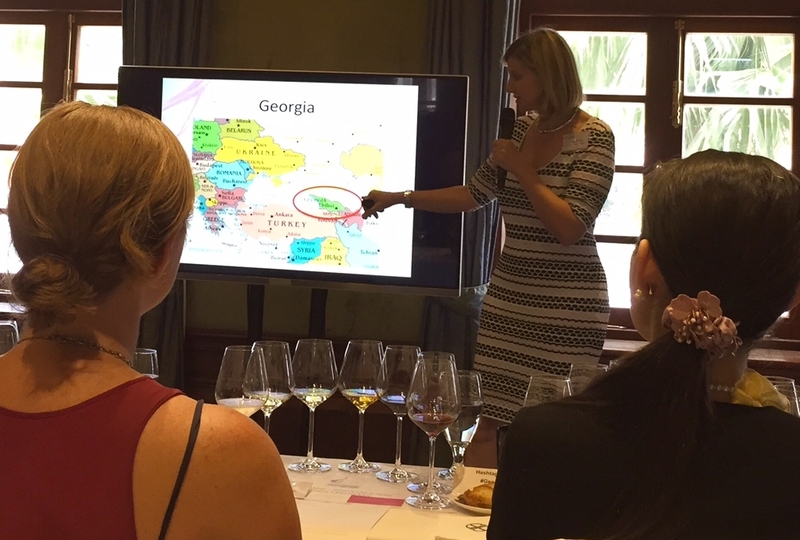 Debra Meiburg, Master of Wine and director of Meiburg Wine Media said, “We were thrilled at the enthusiasm to try Georgian wines and the positive feedback from the Hong Kong wine community. It really demonstrates the level of maturity of this market, which just over 10 years ago had a “Bordeaux or bust” attitude towards wine. 21.07.2015.The World Bank has spent 2.3 million GEL ($1, 017,700) to enhance Georgia’s ancient Qvevri wine-making methods by establishing a Qvevri House (also called sometimes as Qvevri Workshop) in the eastern part of the country. The Qvevri House facilities are being set up in the small village of Ikalto, about 110 km from the capital Tbilisi, with 5,500 m2 allocated to house a museum, an internet cafe, a cultural center equipped with state-of-the-art technologies, and a workshop where visitors can learn ancient wine-making methods. "Apart from restoring the country’s ancient wine-making tradition, the Qvevri House sub-project will further develop the region’s historic, cultural, educational, recreational and touristic potential. The facility will also aid the local economy and offer employment opportunities to local residents," Ahmed Eiweida, the World Bank Program Leader for the South Caucasus, said. The construction of the Qvevri House building began a month ago (read more at Qvevri House will revitalise Kakheti and save ancient winemaking methods. Several senior local government officials and World Bank representatives attended the official laying of the foundation. Construction of the entire site is expected to be completed by September 2016. 18.07.2015. (Hvino News). Georgia is planning to increase wine export to China, according to recent statement made by minister of agriculture Otari Danelia, as he commented on results of his visit to China. "In May of this year, the Chinese minister of agriculture Han Changfu paid a visit to Georgia ... Now I have paid a return visit. We have discussed with our Chinese colleagues the possibility of expanding of cooperation between two countries in the field of agriculture, including issues of increasing Georgian wine export to China,’’ - Russian news agency TASS quoted Mr. Danelia. 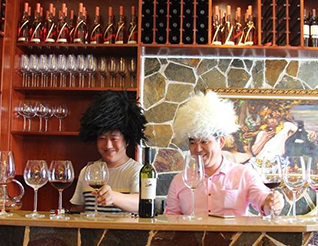 "During the recent years China's demand for Georgian wine has grown up. Development of cooperation with China is of strategic importance for the export of Georgian wine, for the cooperation between the two countries", " the minister said. Russia takes first place, followed by Kazakhstan, Ukraine and Poland. According to the ministry, "in August 2015 in Georgia delegation will arrive major Chinese businessmen interested in increasing exports of wine from Georgia to China, and in cooperation with the Georgian wine companies." As of 6 months of 2015, China ranks fifth among Georgian wine importers. Russia takes first place, followed by Kazakhstan, Ukraine and Poland. According to the ministry, in August Georgia will host a high-level delegation of Chinese businessmen interested in increasing import of wine from Georgia to China, to discuss cooperation with Georgian wine companies. 17.07.2015. (Hvino News). Harpers Wine & Spirit - the Britain's leading publication on wine and spirits trade - today published the article on Georgian wine. Article entitled "The quality and diversity of Georgia" is authored by Tim Atkin, Master of Wine. Mr. Atkin chaired the jury of the recent international wine competition during Winexpo fair in Tbilisi (read more here: Results of 7th International Wine Competition in Tbilisi announced). Mr. Atkin opens his article with question: "How many countries have you visited where the man who stamps your passport smiles and gives you a bottle of wine?". "Wine is part of Georgia’s DNA...Wine is the national drink, consumed with gusto in a series of toasts and salutations at official meals, but also in countless bars and restaurants. Tbilisi is a wine city that’s every bit as vibrant as Bordeaux, Mendoza, Logroño or Florence. In terms of plantings, Georgia is not what it once was, however. At their peak, the country’s vineyards covered 160,000 ha, compared with 45,000 ha today", - the article reads. 16.07.2015. Georgia’s Agriculture Ministry is stepping up its promotion of the country’s wine and winemaking culture in China; with the unveiling of a promotional centre and winemaking house during an official visit of the Agriculture Ministry to China. The opening event for the centre, located in capital Beijing’s Nutrition and Alcohol Research Institute, was led by Minister Otar Danelia and included a presentation and tasting of Georgian products. The event was attended by China’s deputy agriculture minister, wine importers and industry representatives. 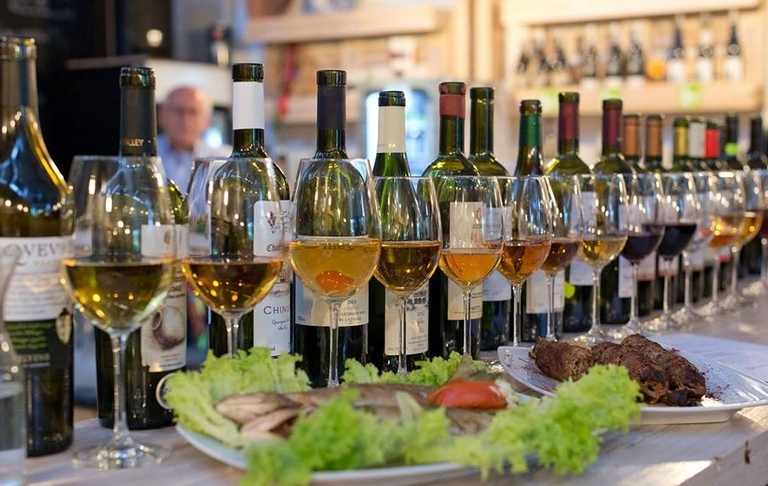 Danelia said the centre aimed to promote Georgian culture and winemaking and contribute Georgia’s efforts to export its products to "strategic” markets. The centre will be led by vice president of the Institute, with a special coordinator contributing from Georgia. In a separate ceremony in China’s Zhagang province, Minister Danelia opened a Georgian wine house where 30 varieties of dry, semi-dry and semi-sweet wines will be represented. 12.07.2015. 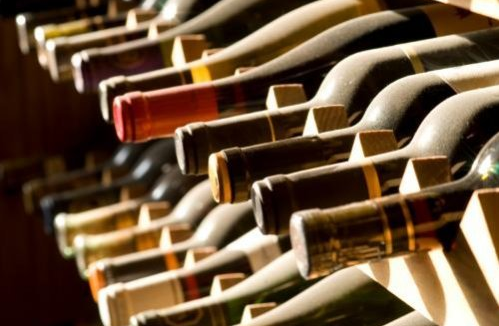 Export figures released by Georgia’s National Wine Agency revealed more than 13.7 million bottles of wine was exported to 33 countries across the globe in the first half of 2015. The total income received from wine export was about $39.5 million USD in the six months period. 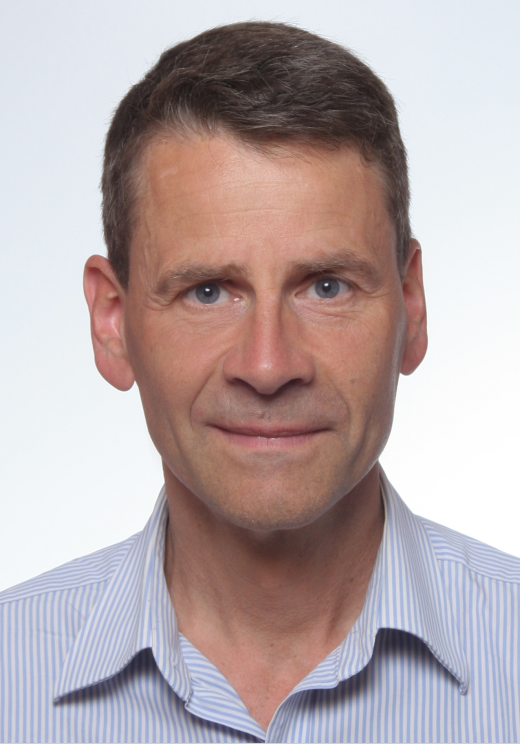 Germany – by 5 percent. Meanwhile the Georgian wine export significantly decreased to the important markets of Russia (by 63 percent) and Ukraine (by 60 percent). "This was due to unstable political and economic situation,” the National Wine Agency said. 10.07.2015. In the ancient wine country of eastern Georgia, Remi Kbilashvili spends three months painstakingly stacking coils of clay to create a massive red, egg-shaped vat, just as his ancestors did thousands of years ago. The vessel, known as a qvevri, will hold 500 gallons of wine once it is fired in a wood-burning brick kiln for a week, then coated in beeswax. It will be used to will be used to ferment the same grape varietals that made Georgia a wine juggernaut, chronicled by the ancient Greek poet Homer. 04.07.2015. In the French city of Juan-les-Pins, Georgian rugby player Ilia Kakhoidze and his Corsican friend Jermaine Gerard decided to set up a Georgian vineyard. This spring, they planted 200 grapevines of Mujuretuli variety and started construction of a marani (underground tunnel used to store and age wine). 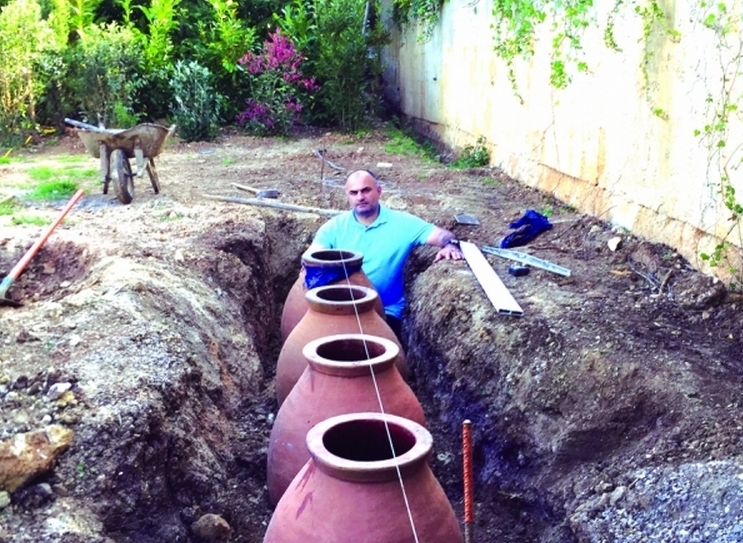 Four Georgian kvevri (giant clay jugs for storing wine) have already been filled. Very soon the marani will also be outfitted with a wine press and a toné (an oven similar to a tandoor). Before the first rtveli (harvest) is complete, a wine tasting room is also expected to be added. Mr. Gerard, a Corsican man hopelessly in love with Georgian wine is a lawyer by profession; despite being a wine enthusiast in general, he never owned a vineyard before. 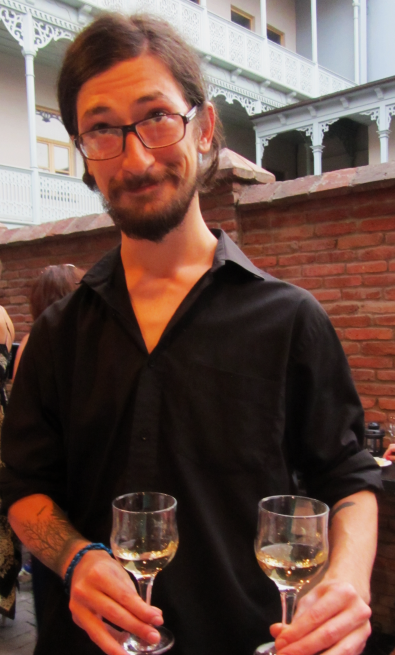 Neither was he ever interested in the winemaking business, including that of France, but after getting acquainted with Georgians, he changed his mind and now tries to do everything to popularize Georgian wine in France. 03.07.2015. 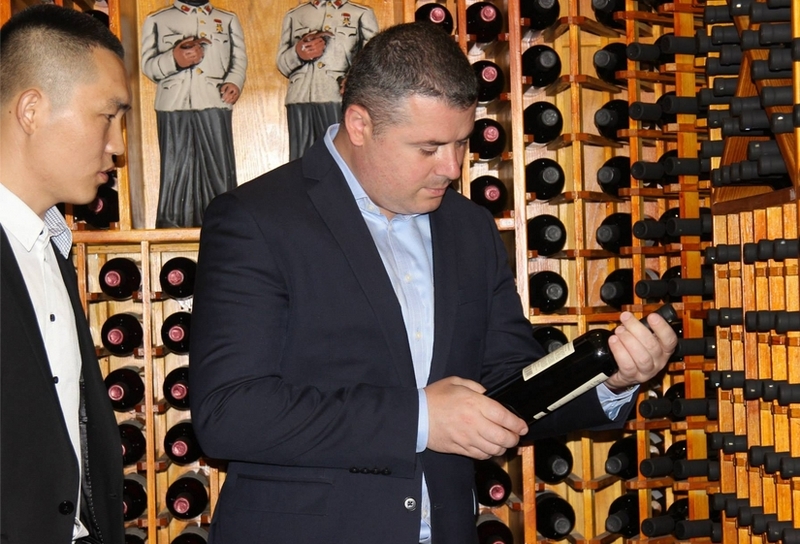 Tbilvino, the leading Georgian winemaker, exported 5 million bottles in 2014. This year the company expects a 5 to 10% decrease due to the Russian and Ukrainian crisis. Contrary to the majority of other winemakers however, Tbilvino will easily compensate for the loss of the Russian and Ukrainian countries, with the rest of its 28 markets. Not to rely on risky markets is the main principle of Tbilvino, and one which the industry is still failing to meet. “Total wine export in the first quarter of 2015 is significant steps behind the same period of the prior year. The results of Tbilvino are much better considering the overall situation of the industry. However, if we compare January-May of 2014 to the same period of the current year, we will see a reduction in export. The Ukraine crisis and economic condition in Russia has contributed to this reduction,” Giorgi Margvelashvili, President at JSC Tbilvino, told Georgian newspaper The Financial. 01.07.2015. A new multi-million GEL facility is being built in Georgia’s Kakheti region to restore the country’s ancient winemaking tradition and develop the region’s historic, cultural, educational, recreational and touristic potential. The multi-functional facility, called Qvevri House, will include a cultural/tourist centre, workshop and museum where visitors can learn the ancient qvevri winemaking methods. The facility will also aid the local economy and offer employment opportunities to local residents. Construction of the new Qvevri House started yesterday in Ikalto village, Kakheti. An area of land measuring 5,407.55 sq. m, earlier allocated to the Qvevri House project, had all the preconditions to create a learning-manufacturing (workshop) and cultural centre that will be equipped with high-class modern technologies, read the project brief. 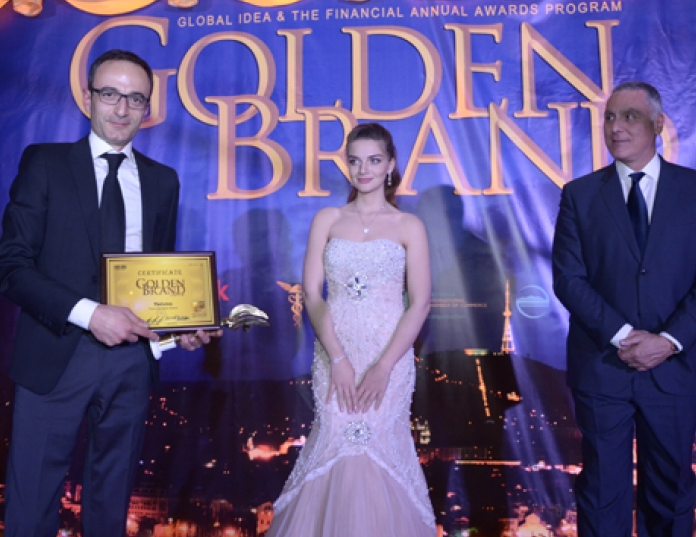 The project, valued at almost 2.3 million GEL, was initiated by the Municipal Development Fund of Georgia’s Regional Development and Infrastructure Ministry and was being financed by the World Bank Group.